Looking out for quick, tasty food in the Gothic quarter? How about an exotic spice-infused rum to wash it down? If you fancy that — and more — served in a quirky, cool bar setting, head on over to The Box. 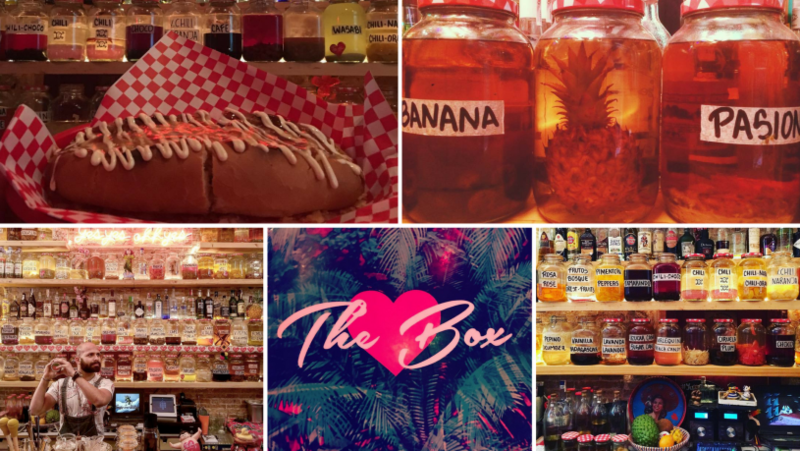 Run by a French bartender and a Colombian chef, The Box is a small, colourful, bar-restaurant. 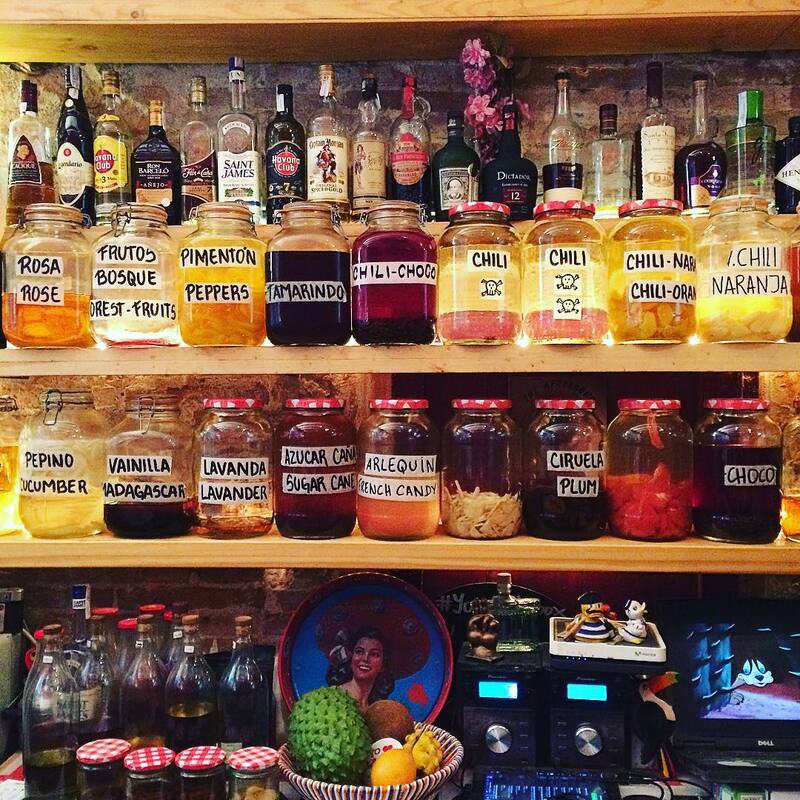 The Latin-American street food and super-chilled party atmosphere have won The Box many fans, and it’s currently sitting in eighth position in Trip Advisor’s rankings for Barcelona eateries. The Box is on the Eastern side of the Barri Gotic (Gothic Quarter), around eight minutes walk from Las Ramblas. This is a great location for visitors to the city, as it’s close to both the Port Vell area and the El Born district. That means that The Box’s visitors have three quite different regions within a few minutes. First-time visitors to the city may particularly enjoy the Born district, which has charms similar to those of the Gothic Quarter, but with fewer tourists. The Box serves straightforward Latin American fare, such as burritos, quesadillas, nachos and hot dogs. The restaurant is proof that if you make a small number of dishes really well, you don’t a huge menu. Foodies may take offence at the food being microwave-made, but no one seems to argue with the results. The Box’s Colombian chef produces lip-smacking meals. The hot dogs in particular attract almost universal praise. If you’ve never been a big fan of hot dogs, you might find that one of their hugely popular pineapple sauce offerings converts you into an aficionado. The Box’s other big draw is the extensive range of infused rums. There are all sorts of interesting flavours to tempt you, including cinnamon, cucumber, lime, lavender, ginger, vanilla, fig and caramelised banana. Watching the bartender flambé you some pineapple, and extract the infusions from the jars with a dropper, is all part of the pleasure. If you’re protective of your personal space and want a sedate sit-down meal, The Box isn’t for you. It’s tiny, cramped, extravert and lively. The sign outside promises ‘cool vibes’ and that’s exactly what you get. Shelves behind the bar are crammed with colourful jars of infusions and other ingredients, turning it into a cross between an apothecary and Aladdin’s cave. Classic cartoons are projected onto another wall, and a pink neon sign saucily proclaims, “yes yes ohh yes”. It’s all young, self-consciously quirky, and heaps of fun. Trip Advisor is always the place to get a good, if somewhat merciless, overview of service. Reviewers there were very positive about The Box. One diner described it as, ‘distinctly un-Spanish in it’s [sic] efficiency’. ’ Perhaps those microwaves are the answer! Another noted The Box’s ‘unbelievably kind and helpful personel [sic]’. Also, if your Spanish doesn’t extend beyond ‘hola’, don’t fret – staff there also speak English, French and German. A visit to The Box needn’t be expensive. Menu items come in at less than €10, and the portion sizes are healthy. To take one example, a Criollo Con Huevo De Cordoniz Hot Dog (hot dog with quail’s eggs, Emmental cheese, onions, crushed chips, ketchup, mayonnaise and pineapple sauce) will set you back €7.40. 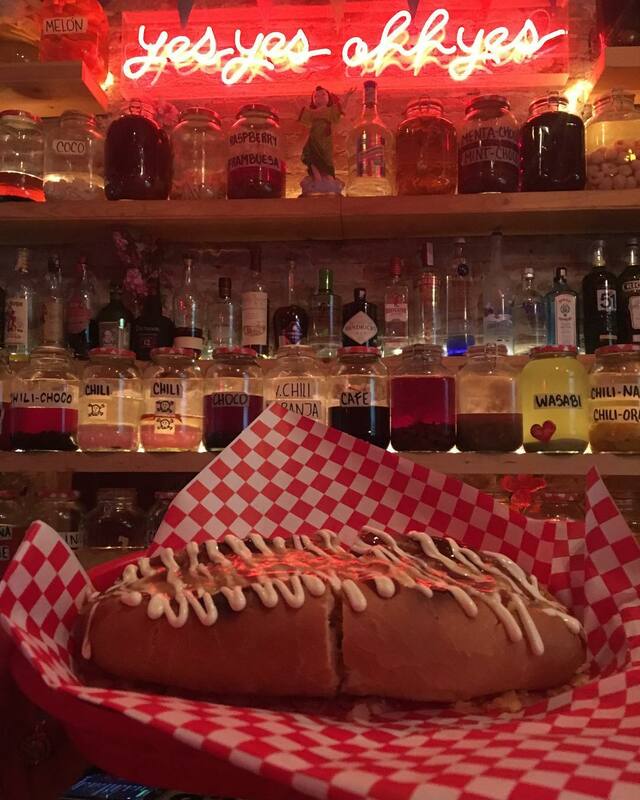 A hot dog should be ample to keep all but the hungriest ticking over for an afternoon. As for drinks, Mojitos are a reasonable €3.50. The biggest risk to your bank balance is that once you start trying the infused rums, you will want to keep on going. “The Box is the best place I’ve ever been on this planet called Earth,” gushed one Trip Advisor reviewer. Well, that might be overstating things a tad, but it is certainly a great little bar-restaurant. Go there for simple, tasty food in a happy-go-lucky bar atmosphere. You won’t be disappointed. No need to book, dependent on the time you might need to squeeze yourself in but go for it. Opening hours: Sunday to Monday: 13:00-20:00 | Tuesday to Wednesday: 18:00-02:30 | Thursday to Saturday: 13:00-02:30.